In this article you will learn about how to automate the copy-paste of buyer details from the Sales & Orders page to the checkout page on the supplier website when processing orders. Once you received an order it will appear in the Sales & Orders page and an icon with a paper plane is being added next to the order action buttons. The new added button is called the "Order Item" button. Clicking on the Order Item button will copy the buyer details to the clipboard of your computer and will open the product page on the supplier website. At this point you can begin the ordering process as usual, click add to cart/buy now and continue to the page where the buyer details and address is required. When getting to the step of providing the details and address of the buyer. 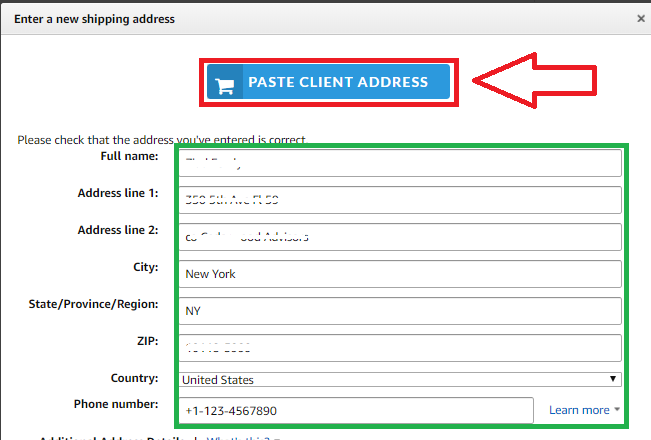 DSM Auto-paste will generate a button with the text "Paste Buyer Address" (or: "Paste Client Address"). Clicking on it will automatically paste the buyer details and address from your computer's clipboard to the page, allowing you to complete the ordering process faster. Note: when DSM Auto-Paste was first created, it used to also click on the checkout buttons automatically for you on the websites of the suppliers Amazon and Walmart, this still works only on Amazon and Walmart but is deprecated for the rest of the suppliers supported by DSM Tool. What is DSM Auto paste Chrome extension?